Twain was truly a genius with words. He could boil a complex idea down into a simple sentence that anyone could understand and make you laugh in the process. One of the greats. wow! Just wow! I was just in a barrier mode filled with anger being held hostage by the very things Mark Twain’s and your expounding words just warned me about. The universe is spectacular and in it’s splendor and array of beauty it doesn’t cease to take care of little ole me. Much success to you and all that you do…I’ll be back for more! Thank you! Great job on this post. 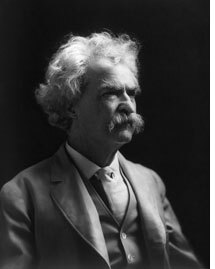 Mark Twain is one of my favourites, and you have compiled his messages and analyzed them orderly and beautifully. Ooo. I love posts like these. Thank you! Amazing people from the past ya know – but I don’t have time to read all their biographies and autobiographies. GREAT post, Henrik! Absolutely loved it! Thank you!